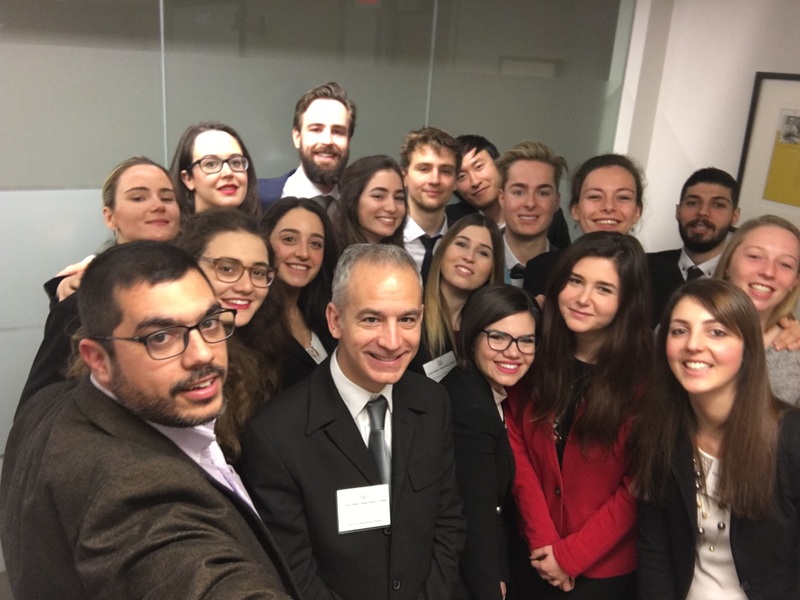 P2P finalists from Belgium, Italy, and Lebanon presented their campaign ideas and met with officials at the State Department. The winning team of Lebanese students hailed from Notre Dame University in Zouk Mosbeh, Lebanon. All video arts and journalism students, their goal was to target at-risk youth and spread awareness about the negative consequences of extremism. They named their initiative ACT, standing for Aspiration, Communication, and Transformation. ACT defined “at risk youth” as having a greater likelihood of dropping out of school, being more easily swayed by certain religious sects, spreading extremist messages, and coming from impoverished backgrounds with no access to sustainable income. ACT’s mission was endorsed by several Lebanese celebrities, including Jessica Azar, a well-known MTV news anchor in Lebanon. The ACT team distributed over 2,000 flyers in Lebanon and conducted a press conference with a guest panel. The event was streamed live on Facebook. They also created a conceptual video. The end result was that the Lebanese government will continue to collaborate with ACT to combat extremist messaging. The Belgian P2P participants created an anti-radicalization campaign at a national level, calling their initiative You-Nite. They mentioned how the Brussels attacks lead to a widespread military presence throughout Belgium. You-Nite studied recruitment strategies that extremists use and how dehumanization strategies encourage disaffected youth to join. Their message emphasized the multiculturalism that exists in Belgium, and they noted that they strive for a peaceful coexistence among all citizens. Among their methods of combating extremism was utilizing Facebook exposure and interviewing citizens in five major cities in Belgium, speaking with school-age children to search for viable solutions, and compiling the solutions in video and digital formats. One You-Nite member even appeared on national television, and other members worked with Belgian government officials. Additionally, they hosted a contest where people submitted their own content, with 62 percent of the target demographic being in the 18 to 24 year age range. You-Nite’s message was broadcast in 23 languages, attracting the attention of immigrants living in Belgium. Other tactics, including organizing a break-dancing event to spread their message, helped the You-Nite team spread the word about their campaign. The Italian P2P participants, students from the University of Cagliari in Sardinia, developed ReAct, with the goal of combatting fake news and extremist ideas distributed on the internet and targeted at high school and university students. The ReAct team strongly believes that information is the key to combatting extremism, and the ReAct team spoke with many immigrants as they developed their campaign. The team then took ReAct on the road, lecturing in different high schools, giving quizzes, and even interviewing with the Italian newspaper Corriere della Sera. The ReAct team also met with Italian embassies for information sharing and to further their goal. To learn more about the teams and their campaigns, follow the hashtag #ChallengeExtremism.